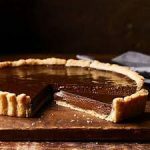 Bittersweet Chocolate Tart | What Goes with What? Preheat the oven to 375° F. In a medium saucepan, combine the cream and milk, and bring to a simmer over medium heat. Remove the pan from the heat, add the chocolate, and stir until the chocolate is thoroughly melted and the mixture is well-blended. Set aside to cool to lukewarm. When cooled, add the egg, and whisk until thoroughly blended. Pour the batter into the prepared pastry shell. Place in the center of the oven and bake until the filling is slightly firm but still trembling in the center, 12 to 15 minutes. Watch carefully-ovens vary tremendously, and baking times may differ slightly. Remove from the oven and place on a rack to cool. If desired, dust with cocoa powder. Serve warm or at room temperature. A word of warning: The doneness window is fairly tight. Start checking the custard at 10 minutes; it should be somewhat set but wobble a little when you very, very gently shake the pan. The first time you do it, it will appear underdone to you, but it will set more as it cools.